Best Online Piano Lessons - Piano Career | Learn How to Play Piano Today! Chopin’s Impromptu No. 1 – a delightful piece full of color and movement! Playing it can be a joyful experience… or a very frustrating one. So how do we conquer this little musical jewel? How do we avoid falling into the most common ‘pitfalls’ – tension, speed walls, poor coordination and expressionless playing? As always, the secret is correct practice . The video below is not a simple tutorial. It is a fragment from our interactive Questions & Answers project at PianoCareerAcademy.com – and it offers solutions to the real problems experienced by Ellen (one of my students) when practicing this piece. Besides answering Ellen’s question, I share many additional tips that will help you to bring this Impromptu to a sparkling performance level . Chopin – Impromptu No. 1 in Ab Major, op. 29. Expressive Analysis and Practice Tips. 01:06. The question that inspired this tutorial. 01:39. Do we really need to create a perfect legato in the RH? Understanding the artistic concept of the Impromptu, and the resulting expressive tasks. 02:37. Which articulation is needed for bringing out the light and ‘sparkling’ effect? 03:48. Step-by-step practice tips. The importance of serious LH practice. 04:46. RH practice. Understanding the layout of the text, and applying the most efficient arm/wrist movements. Non-legato practice. 07:05. Legato practice. Lightening the key attack. Using a ‘throw and gather’ motion. The needed ‘detached’ legato. 08:49. Adding the pedal. What is the most appropriate pedaling principle for the outer sections? 10:59. Practicing both hands together. How to improve your coordination. Sound balance. 13:25. The spots where we can make an exception from the ‘detached’ legato principle. The ‘lyrical element‘ from bars 8-12. 14:25. How to voice the melody formed by the LH quarter notes (bars 8-12). The needed practice steps. The importance of phrasing. 17:18. Combining both hands together. The 3 layers of sound intensity. 18:47. 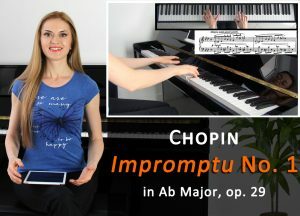 The importance of intonation in playing Chopin. Intoning the wider intervals. 19:35. Pulsation and its role in reaching the final tempo. 20:40. Conclusion. Where to find the full tutorial . 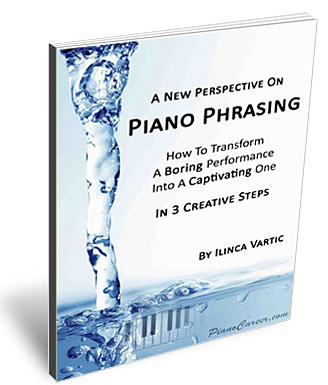 Get access to the full tutorial (and to my video answers from ALL the past editions of our Questions & Answers project) by becoming a member of my Piano Coaching Program at PianoCareerAcademy.com! In the Private Members Area you will also discover many hundreds of other exclusive tutorials for ALL levels (including step-by-step courses and interactive projects) that reveal the professional secrets of the Russian piano school – helping you to transform your technical & expressive skills, and take your playing to a whole new level of freedom, brilliance and artistry! P.S. Many new articles and video tutorials are coming soon on PianoCareer.com! Follow me on Facebook, Twitter or Google + (and now also on Pinterest!) to get instant updates, support and motivation!